FRESNO, Calif. (KFSN) -- The number of active hate groups in California ranks first among other states in the nation, Florida comes in second. The Miami Herald reports that according to the Southern Poverty Law Center, there are more than 60 active hate groups in Florida. The SPLC's report features a map detailing more than 900 hate groups actively operating across the country. California ranks number one with 79. 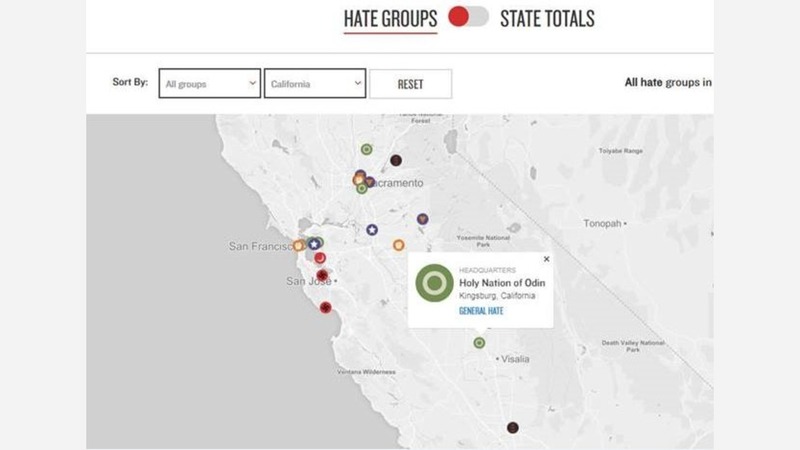 A search of the Southern Poverty Law Center's "Hate Map" SPLC Hate Map shows one group in Central California. The "Holy Nation of Odin" in Kingsburg is listed as a general hate group. According to the SPLC's website, general hate groups espouse a variety of rather unique hateful doctrines and beliefs that are not easily categorized. Four of the 63 in Florida are in Miami-Dade County and two are in Fort Lauderdale. The Nation of Islam is among groups in both areas. The report says in 2016 there were 130 Ku Klux Klan groups and 193 Black Separatist groups active nationwide. In 2011 the groups peaked at more than 1,000 before decreasing to 784 in 2014. Last year's 917 was part of an increase since.